With a script that never forgets its heroes' humanity and no shortage of superpowered set pieces, The Avengers/2 lives up to its hype and has received a lot of applause. Till now, there are about 4,786,308 likes of The Avengers on the official FB page. This is a rare case achieving such enormous success among a mass of hero-themed movies. So it is worth of collecting a genuine DVD of The Avengers. However, feeding DVD disc in out the DVD player repeatedly is certainly a potential hazard to get DVD disc scratched or even damaged easily. And it is usually inconvenient to take along with disc during a long trip. As a result, it is necessary to create a copy and rip DVD The Avengers to a video format that is playable on portable device to prevent DVD The Avengers from being scratched with a professional DVD ripper. However, such newly published DVDs are always protected from illegal DVD copy piracy, making DVD copy a hard nut. So when you are eager to backup and rip DVD The Avengers for watching it on the go, you will encounter embarrassment. Decrypt and rip DVD The Avengers to MP4, MOV, AVI, H.264, or iPhone, iPad, Apple TV, Samsung, HTC, Xbox, PS4, Chromecast videos with MacX DVD Ripper Pro. Issue 1: I have the latest version of anydvd hd and clonedvd possible. I got to 82% and it stopped. I am so frustrated, regarding copying the avengers dvd. Issue 2: VLC won't play the Avengers DVD. Netflix DVD Avengers crashes my VLC 2.0.3 every time before there is any response from the application. VLC just quits without an error message. Issue 3: I have been using handbrake for a while, and it has worked fine for most DVD's I have ripped. It doesnt seem to be working with a new DVD "the Avengers". It crashes every time during the scan process. anyone have a solution? The issues mentioned above are just the most asked ones. other errors such as won't choose the right title, audio video out of sync, etc also make DVD users head-scrach while they rip DVD Agengers/2. 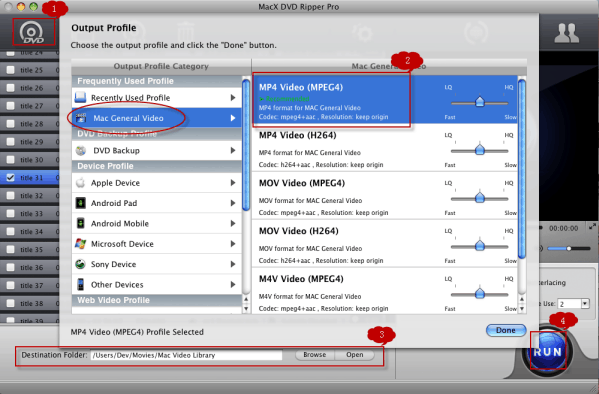 To cater to the requirement of ripping DVD movie The Avengers successfully, MacX DVD Ripper Pro demonstrates a great leap from the previous edition by providing a unique solution for lasted released DVDs, even from Disney Marvel, so that you can circumvent all the copy protections and rip DVD The Avengers with ease. It helps to copy Avengers 2: Age of Ultron DVD as well as other newly released DVDs like Big Hero 6, Hunger Games 3, Cinderella, etc within a few clicks. As a professional The Avengers DVD ripper, it enables you to convert DVD to FLV, MP4, MOV, AVI, MP3, MPEG, etc for playback on iPhone, iPad, Android, making your DVD collection more mobile. This Mac DVD ripper which offers the function to rip and convert DVD The Avengers on Mac while keeping high video quality. The following will take The Avengers DVD ripper for example to introduce the step-by-step guide. Step 1: free download The Avengers DVD ripper on Mac, import the DVD The Avengers by means of clicking "DVD Disc" button. Alternatively, you can import this disc by hitting "DVD Path". Step 2: You can simply hit the "Copy" button to backup DVD on your Mac or choose output video format you like such as to iPhone. There are also DVD to MP4, DVD to MOV, DVD to MPEG, DVD to Music, DVD to iPad, DVD to Samsung, DVD to HTC, etc, enabling you to experience the shocking visual feast no matter on your iPhone, HTC, Samsung, or iPad. Step 3: Choose the destination path for your output video file by hiting the "Browse" button. Step 4: Start ripping DVD The Avengers on Mac by clicking "RUN" button. Note: This DVD The Avengers ripper is only eligible for Mac users, for Windows users, you can visit MacX DVD Ripper Pro for Windows to rip The Avengers DVD on PC. DVD fans usually find it's difficult to rip Disney DVD on Mac and PC. This article will mainly focus on Disney DRM copy protections and tell you how to remove Disney X-project protection and rip Disney DVD Avengers 2, Big Hero 6, Cinderella, etc with 99 titles effortlessly. How to rip copy protected DVD for free? MacX DVD Ripper Mac Free Edition is an ideal solution to backup any DVD movies by stripping off the DVD copy protections. Rip protected DVD for free to MP4, MOV, FLV, MPEG, iTunes, MP3, etc. Puzzled over how to copy DVD Big Hero 6 Disney movie now? This guide shows you the best way to make a copy for the encrypted Big Hero Six movie in short time so as to easily join it to Disney movie collection for reviewing at anytime.